Mount Jerome Cemetery & Crematorium (Irish: Reilig Chnocán Iaróm) is situated in Harold's Cross on the south side of Dublin, Ireland. Since its foundation in 1836, it has witnessed over 300,000 burials. Originally an exclusively Protestant cemetery, Roman Catholics have also been buried there since the 1920s. The entrance to Mt. Jerome, on right. The name of the cemetery comes from an estate established there by the Reverend Stephen Jerome, who in 1639 was vicar of St. Kevin's Parish. At that time, Harold's Cross was part of St. Kevin's Parish. In the latter half of the 17th century, the land passed into the ownership of the Earl of Meath, who in turn leased plots to prominent Dublin families. A house, Mount Jerome House, was constructed in one of these plots, and leased to John Keogh. In 1834, after an aborted attempt to set up a cemetery in the Phoenix Park, the General Cemetery Company of Dublin bought the Mount Jerome property, "for establishing a general cemetery in the neighbourhood of the city of Dublin". 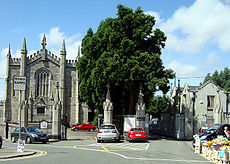 The Funerary Chapel in the cemetery was the first Puginian Gothic church in Dublin. It was designed by William Atkins. In 2000, Mount Jerome Cemetery established its own crematorium on the site. Michael Colivet (1882–1955), Irish politician, Commandant of the Irish Volunteers for Limerick City, a founding member of the Irish Republic and, in later years, Chairman of the National Housing Board. Ethel Kathleen French (née Moore, 1871–1891), artist and illustrator, first wife of Percy French. She died in childbirth with their first child. Joseph Sheridan Le Fanu (1814–1873), writer and editor, along with his wife, Susanna Bennett, her father and two brothers, in the same vault. William Vitruvius Morrison (1794–1838), architect; son and partner of Richard Morrison. Máirtín Ó Direáin, (1910–1988), Irish-language poet. John Skelton (1924–2009), artist and illustrator. Ellen Smyly (1815–1901) founder of the Smyly Homes. Bindon Blood Stoney (1828–1909), engineer. Isaac Weld (1774–1856), topographical writer, explorer and artist. William Wilde, father of Oscar Wilde. His wife, Jane Francesca Elgee, is commemorated on Sir William's monument, but she was buried in Kensal Green Cemetery in London. There is a large plot to the deceased members of the Royal Irish Constabulary and the Dublin Metropolitan Police. The cemetery contains the war graves of 35 British Commonwealth service personnel from World War I and 39 from World War II. The remains of French Huguenots from St. Peter's Churchyard, Peter's Row (now the location of the Dublin YMCA), which was demolished in the 1980s, and from St. Brigid's and St. Thomas's churchyards are interred in the cemetery. Over 200 children of unmarried mothers who died in the Protestant run Bethany Home were buried in unmarked graves in the cemetery. There is a plot where unnamed children from Kirwan House the Protestant run Female Orphan Home are buried. Recent burials include the notorious Martin Cahill (1949–1994) (known as "The General"). His gravestone has been vandalised on numerous occasions and is currently broken in two with the top half missing. His body has since been removed to an unmarked grave in the cemetery. The cemetery has one of only two Christ-thorn bushes in Ireland (the other is in the Botanic Gardens). Then Mount Jerome for the protestants. Funerals all over the world everywhere every minute. Shovelling them under by the cartload doublequick. Thousands every hour. Too many in the world. Ulysses, Chapter 6, Hades episode, James Joyce. ^ Somerville-Large, Peter (1988). 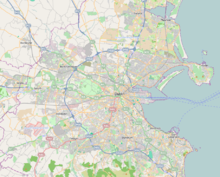 Dublin: The First Thousand Years. Belfast: The Appletree Press. p. 226. ISBN 0-86281-206-2. ^ a b c d Langtry, Joe and Nikki Carter, eds. Mount Jerome: A Victorian Cemetery. Staybro Printing Ltd., Dublin 1997. ^ Boylan, Henry (1998). A Dictionary of Irish Biography, 3rd Edition. Dublin: Gill and MacMillan. ISBN 0-7171-2945-4. ^ Barry, Aoife. "Family pay tribute as Derek Davis laid to rest at Mount Jerome Cemetery". ^ a b c d e Patao, Sofia (2000). Funeral Art and Architecture. Dublin: EEC. ISBN 84-8156-270-X. ^ "St. Peter's Churchyard Excavation Report".